Drones seem to be almost everywhere recently. Whether military personnel are using drones for national security issues or businesses are delivering packages to customers, these Unmanned Aerial Vehicles (UAVs) are filling the airspace quickly. In the oil and gas industry, UAV technology offers a broad range of benefits that allow the industry to improve in multiple areas. The foremost important one being to monitor the security and safety of pipeline infrastructure. In 2015, the U.S. Federal Aviation Administration issued more than 1,000 exemptions allowing companies to safely operate commercial unmanned aerial systems (UAS). In order to fly a small UAS for commercial purposes the FAA requires that businesses file a 333 petition for exemption. This process is relatively lengthy. However, it ensures that businesses are held accountable to the health and safety of the communities they intend to fly over. A priority that is paramount to smooth operations in every aspect of work in the gas industry. • No unauthorized persons in the flight area. • Observe a minimum safe altitude to allow for obstacle and terrain clearance. • UAS operator must have a current pilot’s license. • All flights are limited to 400 ft maximum altitude. • Visual line of sight operations only. • The UAV must be below 55 lbs, operate at low speeds and operate at least 3 miles away from any airport. Given the rules, the more advanced UAS come with cutting-edge software packages that are ready to be programmed and tailored for specific missions. Additionally, automatic flight ceilings, horizontal boundaries, speed and return to home points can all be pre-set to ensure the safety of the operators and the public. 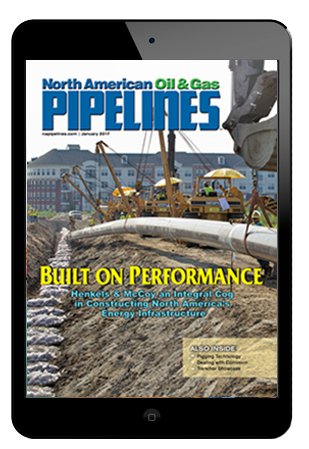 This means that inspecting oil and gas pipelines is even easier, because the technology to locate key features is already accessible at the pilot’s fingertips. With the aid of high powered cameras, zoom lenses, gas sensors and additional sensing technology; data collection and transmission through Wi-Fi and radio frequency brings difficult to detect information to a client in a matter of minutes. In 2015, the U.S. Federal Aviation Administration issued more than 1,000 exemptions allowing companies to safely operate commercial unmanned aerial systems (UAS). In order to fly a small UAS for commercial purposes the FAA requires that businesses file a 333 petition for exemption. For those in the gas industry specifically, operating a UAS presents several options to revolutionize pipeline monitoring operations and can offer a range of new services that will improve worker and customer safety, reduce carbon footprints and ultimately cut costs. When properly used, tethered UAS are beneficial for monitoring the security of transmission mains. Because the tether can provide power, data links and, of course, a tether to the ground, technicians can easily recognize potential security threats along the lengthy pipelines without having to worry about limitations set by battery life. Monitoring transmission pipelines is a difficult and often times a dangerous task for workers as well. Transmission mains are not the only areas where UAS can provide effective, yet practical functions. In the highly trafficked areas of cities and suburbs, gas distribution utilities can monitor gas leaks, infrastructure and third party work with a UAS. As a result utilities are increasing worker and customer safety, reducing costs associated with site evaluation and inspection and ensuring that resources are being properly allocated. Additionally, UAS operators are able to monitor gas leaks in hard to access, dangerous areas such as under bridges, which would once put workers at risk. Now those same inspections can be performed without ever having to take your feet off the ground. Staying ahead of challenging problems in an age-old industry can establish a gas or energy utility with a UAS at the forefront of innovation. With new EPA regulations, green energy initiatives and other government mandates the oil and gas industry has pressure to pioneer new programs and initiatives that safeguard infrastructure. Staying ahead of challenging problems in an age-old industry can establish a gas or energy utility with a UAS at the forefront of innovation. With new EPA regulations, green energy initiatives and other government mandates the oil and gas industry has pressure to pioneer new programs and initiatives that safeguard infrastructure, while continuing on a path of constant improvement. Aubrey Anderson, aerospace engineer and head of drone operations for New York-based ULC Robotics Inc. says there’s no end to discovering new uses and applications for drones in the energy industry. When gas and energy utilities are seeking dynamic technologies to drive innovation and increase efficiency, UAS can provide exciting new opportunities and fulfill an essential duty — ensuring the security of pipeline infrastructure, employees and customers. Gregory Penza is president and CEO of ULC Robotics Inc., based in Hauppauge, New York. The company works with gas utilities and other energy-related organizations to provide advanced equipment and services for asset inspection, maintenance and other specialized projects.